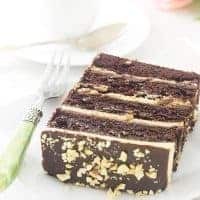 Take one bite of this Chocolate Peanut Butter Layer Cake and you will be dancing with joy! 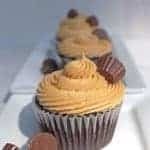 Chocolate and peanut butter is a sensational flavor combination. 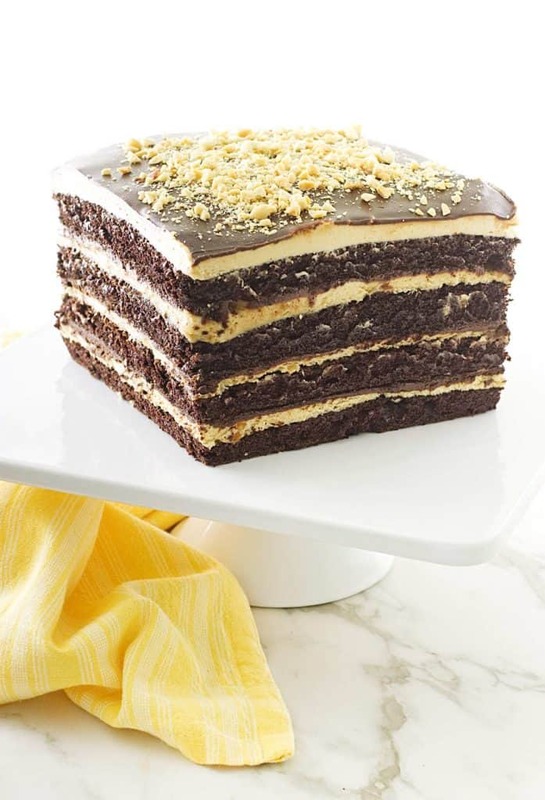 We have stacked up layers of dark chocolate cake, fluffy peanut butter filling, and chocolate ganache. Finally, a shiny chocolate ganache and chopped peanuts are the finishing touches. I am not very efficient in torting a cake layer. 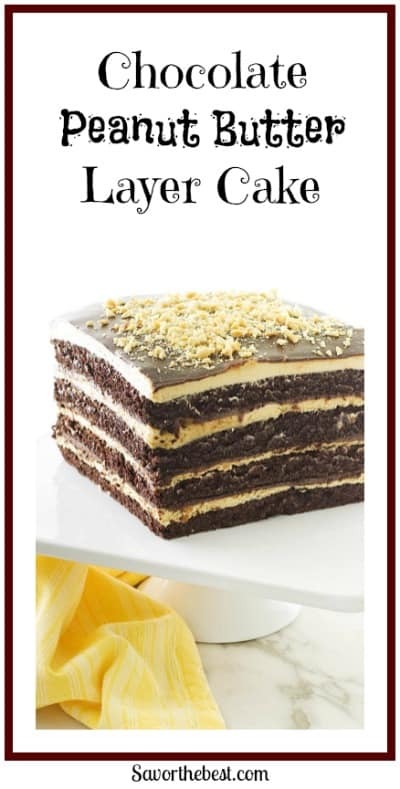 Every attempt has ended with un-even lopsided layers, but these cake layers are perfect! I used our Intense Chocolate Cake recipe to bake the moist chocolate layers. 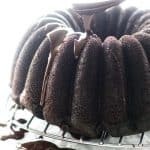 By baking this easy chocolate cake in four eight-inch square cake pans, I created four flawlessly thin layers. WooHoo! The layer of peanut butter fluff is a combination of cream cheese and peanut butter that are perfectly sweetened. Heavy cream gives it a luscious, fluffy creaminess. To make the cake even more decadent, a thin layer of chocolate ganache coats the heavenly peanut butter fluff. The deliciousness of this cake is beyond description. The cake is chocolatey and moist. The peanut butter fluff is sublime and incredibly yummy. And the chocolate ganache is addictively rich and fudgy. Chocolate Peanut Butter Layer Cake with a shiny ganache topping and chopped peanuts. Place the first layer on a cake plate and spread with 1/4 of the peanut butter filling. Next, spoon and spread 1/3 of the chocolate ganache over the filling. 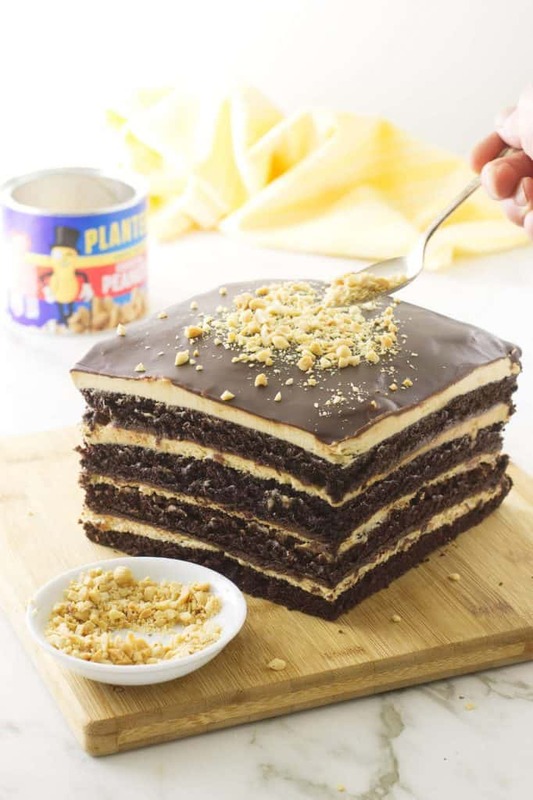 Add the next cake layer and continue with the stacking process, ending with a layer of peanut butter on the top. 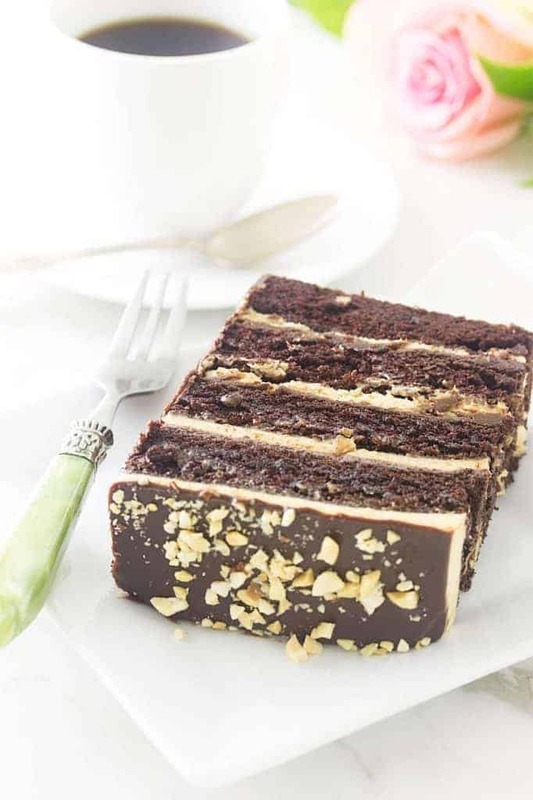 Finally, the satin-smooth ganache was poured over the top of the cake and garnished with chopped peanuts. The smooth ganache topping is made just a little differently than the ganache in the cake layers. A touch of corn syrup keeps the ganache from becoming too firm, while a little hot water produces a beautiful shine. After the ganache topping cools, slice off a scant quarter-inch from each side of the cake to show off the lovely layers of the cake. Consequently, you will have some scraps to eat. That is never a bad thing. To learn more ideas for using ganache, plus some tips and tricks, click over to Betty’s blog post for a great tutorial. Have you made this Chocolate Peanut Butter Cake? If you did then please send us a picture and tag us on Instagram. As a matter of fact, we would love to hear from you in the comments below. Preheat the oven to 350°. 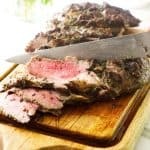 Line the bottom of four 8-inch cake pans with parchment paper, grease and flour the sides. Pour the batter equally into the four prepared pans. You will have about 1 1/3 cups or 350 grams of batter in each pan. Bake the cakes, 2 pans at a time, for 15 to 18 minutes. (a toothpick inserted in the center of the cakes should come out clean). Allow the cake layers to cool completely before assembling. Blend the cream cheese, peanut butter, sugar and vanilla together until smooth and creamy. Add the cream and whip until soft and fluffy. Add the chopped chocolate to a small dish. Bring the cream to almost a boil and pour over the chopped chocolate. Cover with a plate and allow to soften for 5 minutes. Stir until smooth. In a small saucepan over medium heat, add the cream and corn syrup and bring to a simmer, stirring to combine. Remove from the heat and add the chocolate, cover and let stand for 5 minutes to soften. Stir the mixture until it is smooth, then stir in the hot water until the glaze is shiny and pourable. 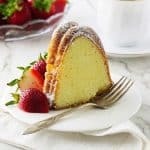 Remove the cake from the refrigerator and let it sit for 30 minutes at room temperature. Place the first layer on a cake plate and spread with 1/4 of the peanut butter filling. Spoon and spread 1/3 of the chocolate ganache. Add the next cake layer and continue with the stacking process, ending with a layer of peanut butter on the top. Pour the ganache glaze on the peanut butter layer in the center, quickly and carefully pick up the cake and tilt it to allow the glaze to run to the edges. Continue tilting until the surface of the cake is completely covered. It is okay if the glaze oozes over and down the edges. Do not use a spatula to spread the glaze as it will not be smooth and shiny. Let the cake sit at room temperature until the glaze is set before transferring to the refrigerator for 2-3 hours. 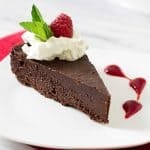 Before serving, remove the cake from the refrigerator and using a sharp knife, slice a bare 1/4-inch off of each side. (Do not discard the trimmings, they make a delicious snack for another day). Sprinkle the chopped peanuts over the top of the cake and transfer the cake to a serving plate. When making the chocolate ganache, allow it to sit to thicken to a spreadable consistency about that of applesauce. 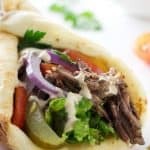 If it becomes too thick, set it over a pan of hot water and stir to be spreadable. This is a rich, decadent dessert, a little goes a long ways in satisfaction. Serving suggestion: Cut the cake in 1-inch thick slices, then cut each slice into 3 equal slices for 24 servings. 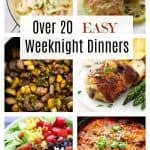 So glad I found your recipe. Definitely gonna it a try and hope it will turn out excellent. Thanks for sharing.